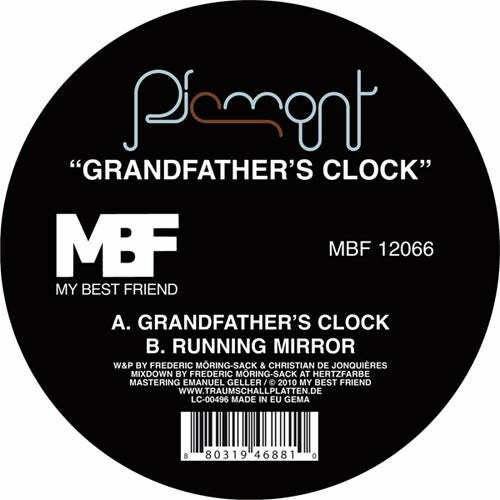 Maybe „Grandfather's Clock“ is the most house influenced release from the German duo Piemont so far. Going more deep dirty and housy this time... they turn towards a more relaxed and slack approach. Chopping up bits of vocals and sounds, tight and funky, this is what Piemont is all about. Remixes on the digital side of „Grandfather's Clock“ will come from Rodriguez Jr.
"Running Mirror" refers to Giorgio Moroder respectively Hi Energy influences and is a hypnotic cool groove monster that will convert spaces into soulful places. Frederic and Christian have released a good dozen of records now and have been very successful. With “peak time tracks” such as “Carbonat“ being played by the whole lot of Ibiza DJs and big names around the world. "Running Mirror" definitely manifests a turning point in their musical spectrum... to deeper grounds of electronic dance and will get other DJs involved in their manifold world of music. After his remix for Dominik Eulberg, Rodriguez Jr delivers with this remix of Grandfather's Clock a monster bassline, big but bouncy which gives a nice up and down movement to the linear drive of the original. Cool piano chords represent the main theme of the remix which work in a hypnotic way.